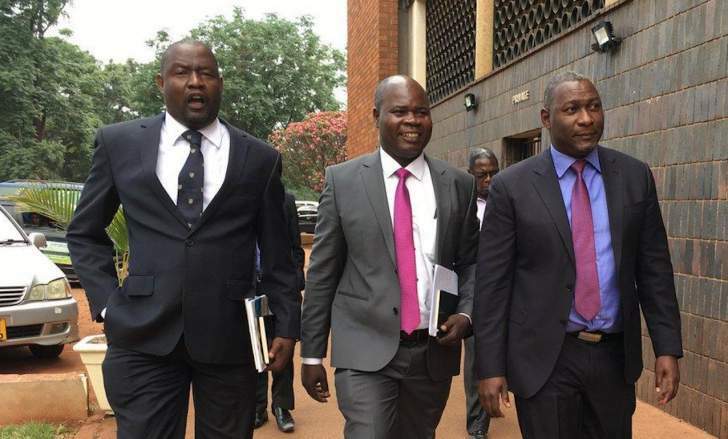 Supa Mandiwanzira with his lawyers. MASVINGO- The High Court has thrown out a criminal abuse of office charge against former Information Communication Technology Minister Supa Mandiwanzira. High Court jugde Justice Nicholas Mathonsi ordered that the charge, accusing Mandiwanzira of having handpicked a South African company to investigate a murky Netone contract, be set aside and quashed. Mandiwanzira’s efforts led to the recovery of US$30 million that had been fleeced from Netone by a foreign supplier, Huawei. The former Minister engaged Megawatt to do consultancy work for NetOne telecommunications after the former company Chief Executive Officer, Reward Kangai, who was the key witness in the state’s case against the former minister, had signed a $218 million deal with Huawei Technologies without going to tender. Mandiwanzira applied for an exception to the charges but Harare magistrate Elijah Makomo dismissed the application arguing the Nyanga South member of the House of Assembly had a case to answer. Mandiwanzira then approached the High Court seeking to overturn the magistrate’s ruling. Justice Nicholas Manthosi on Wednesday granted the application by Mandiwanzira effectively quashing the criminal abuse of office charge against the former minister. Mandiwanzira, who recently took to the stand at the Magistrates Court indicated then that he felt horrible that he was being dragged before the courts for doing the right thing for Government and NetOne. “I feel horrible that I am being criminalized for doing the right thing. I feel horrible and gutted that I may be sent to jail for up to 15 years for merely doing what was right in my job, that is to protect public interest in making sure those that had fleeced (NetOne) returned the money. What I did is what was and should be expected of a Minister. Where there was a loss to the taxpayer l recovered US$30 million. I really feel gutted,” he said. As the basis for the exception, Mandiwanzira, through his lawyers, Advocate Thembinkosi Magwaliba and Brian Hungwe, instructed by Selby Hwacha, equated Mandiwanzira to a person who chases after a thief and recovers stolen goods but he himself is instead arrested. His lawyers outlined that NetOne was not a procurement entity at the material time. “Second it was contended that even if it were a procurement entity because the allegations were that the procurement was obtained on a pro bono basis, no procurement contract eventuated which could contravene in the procurement laws,” Magwaliba said. “It is evident that NetOne is not a ministry, department or other division of government. It is also not a statutory body. Nor is it a local authority. It is common cause that it is a private limited company incorporated in terms of the Companies Act.